This hotel has a total of 26 adult-only luxurious pavilions. Every one of the pavilions has its own private pool, which can be accessed through the sliding doors of the large en-suite bathrooms, as well as an outdoor shower and daybeds. 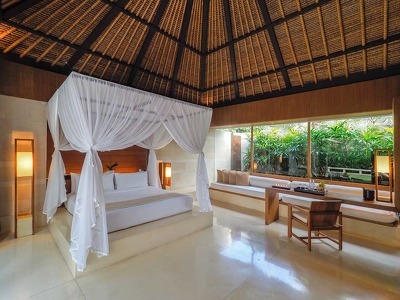 You can choose between the Single Pavilions, Double Pavilions which have 2 bedrooms and the Deluxe Single Pavilion. All of the rooms enjoy 24-hour Butler service, complimentary WiFi and a gourmet breakfast in the Theato Restaurant. The Single Pavilions are massive! Sleeping just 2 adults there is plenty of space, inside and out to lose yourself and each other! Light streams into the rooms and the large en-suite bathrooms and each pavilion has its own private plunge pool with day beds. One step up is the Deluxe Pavilion. They all have their own 10m pool with lounging area and large en-suite bathroom with double basins. Sleeps 2 adults. The Double Pavilion sleeps 4 adults in 2 bedrooms. They all have their own 10m pool with lounging area and large en-suite bathroom with double basins. Book a stay at The Bale and get 25% off. The Balé is a lovely contemporary boutique hotel with spa located on a breezy hillside of Nusa Dua, walking distance from the beach. A serene, luxurious Chic Retreat whose every purpose is to help you relax and re-energize in style. The 'no children' policy allows a couple to really be a couple while the butlers, available 24 hours a day, cater to every possible need. For those seeking something else than the usual Spa, here at The Balé you have the chance to rejuvenate your body, expand your mind and spend quality time with a partner. As part of the philosophy, the Spa provides a wide selection of treatments in well-designed treatment rooms complemented by a Sauna and Jacuzzi with garden and water features. The Spa also offers a wide selection of wellness and holistic programs including but not limited to Yoga, Meditation, Shiatsu, Anma, Tai Chi, Qi Gong, Acupuncture, etc. A gym is also part of the facility. Lounge by the main pool, browse the art shop or head to the private beach club for the day. The Balé has so much more to offer than other boutique hotels in Bali. 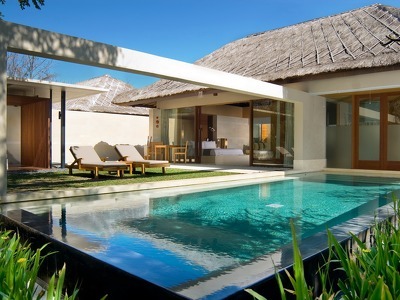 The food at The Balé, described in Condé Nast Traveler as 'one of Bali's best' reflects the modern architectural style. While seemingly simple, it's rich in detail and flavour. New to The Balé is TAPA, Balis exciting new global bistro, combining tempting cocktails, mellow tunes and delicious tapas-style dishes from around the world from Tuesday to Sunday. Faces Restaurant by the main poolside features an open kitchen awakening guests with fresh smells of coffee and baked bread in the morning and serving Mediterranean and Indonesian cuisine through the day while Bliss, located at the Spa, caters to those looking for spa cuisine. Enjoy cocktails in the evening at Fluid bar and lounge or dine in the privacy of your own pool villa with a private bbq or a specially prepared candlelit dinner thoughtfully prepared by the brilliant culinary team. The Bale is perfect place to start your journey into the Island of the Gods. With just 26 adult-only luxury pavilions - each with their own private pool - it really doesn’t come much better than this. You must have the Foot Treatment and if you can book Sudarmi, her hands are magic and your feet are floating on air after a wash, traditional Balinese scrub and deep Reflexology massage. The easiest way to get here is by taxi from the airport. Ngurah Rai International Airport, 20 minutes by car. If a cancellation is made within 7 days of arrival, 1 night will be charged. For the offers, is a cancellation is made at any time 1 night will be charged. If a cancellation is made within 7 days of arrival, 100% of the total price will be charged. Please note that The Balé doesn’t accommodate children below 16 years. Rates at The Bale are per room per night and exclude 11% government tax & 10% service charge. Spent our first night here, arrived late but they were very welcoming. It was old & a bit tired but we loved the Villa & the King bed was very comfortable, loved the outside shower. The private pool was very welcome. The only negative was the restaurant & pool was in need of a revamp. It was great value for what we got.